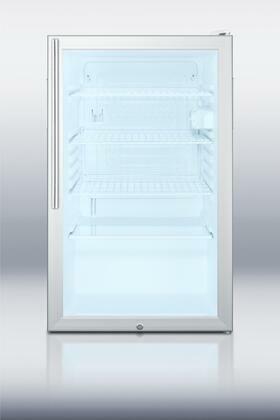 The SCR450LBIHVADA is a 20" wide all-refrigerator with a 4.1 cu.ft. capacity. It has a white cabinet with a glass door and keyed lock. A hospital grade cord with a 'green dot' plug offers additional safety in high traffic areas. This model includes a sleek stainless steel handle with a thin 14 mm diameter. 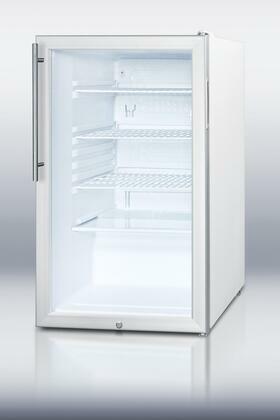 Inside, the SCR450LBIHVADA includes adjustable wire shelves for attractive and convenient storage. The interior light functions on an on/off rocker switch and an adjustable thermostat offers easy temperature control. At just under 20" wide, SUMMIT SCR450LBIHVADA is ideally sized for any ADA compliant setting and can function as a built-in or freestanding unit. 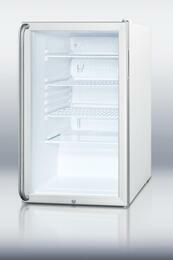 I was looking for ADA compliant fridge for my brother and this model appeared to be optimal choice. Besides that it has many many great features. Recommend to all, who is interested in ADA refs.